"I serve this casserole in individual baking shells; to minimize spills during baking, place shells on a foil-covered baking sheet. 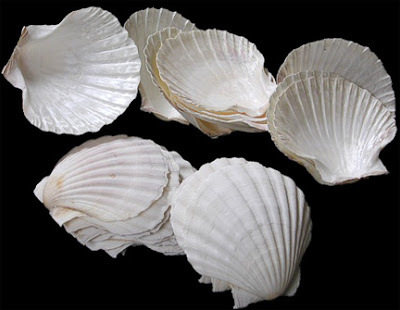 You can order white Irish scallop baking shells like the ones below from Amazon or this vendor. Believe it or not, Costco has very good prices on the canned crab (3 to pack). Consider serving this casserole with a tossed salad, steamed broccoli and Chardonnay. My mother would serve her home-canned peach halves either instead of the broccoli, or as dessert. This is one of the first main dishes she let me cook for family dinner." In a saucepan, combine soup, milk, egg and 2 Tablespoons of the Parmesan cheese. Stir over Low heat until cheese is melted and mixture is hot. Stir in crab, shrimp and mushrooms. Spoon into 4 large baking shells (supplier photo below). Toss together all of the Topping ingredients and sprinkle crumbs over the seafood mixture. Bake at 375ºF for 20 minutes. Garnish each serving with parsley sprigs and lemon twists. Adapts Better Homes and Gardens Encyclopedia of Cooking (Meredith Corporation, 1971?). Do you have a favorite meat-free casserole? Send us the recipe or tell us about it in comments!